The Perfect 6 oz. Gourmet Coffee and Tea Container. The ultimate parmesan cheese dispenser prevents caking. Dry goods such as herbs and spices, coffee, tea, sugar, nuts, candies, dried fruit, protein powder, vitamins will all last 3x longer. Ideal for Q- tips; make up, small cell phones as well as MP3 players, toy soldiers, cash, coins and sensitive electronics. The soda can size 6 ounce Snackvac, is perfect for the kitchen, office, road trips and school lunches. Refrigerated items such as cheese, lettuce, parsley, basil, cut onions, scallions, zucchini and most leafy vegetables will last 2x longer. Tightvac prevents weevil and bug infestations. Keeps dry goods up to 1 year and beyond! Simply the best container for RV's and travel, camping, boats, cottages and second homes. Store any Tightvac conveniently on the countertop, in the pantry, the fridge or freezer. Our Vacs save you money and guarantee fresher for longer food storage. The United States patent office granted us a patent on a vacuum container - Our Vacs create a partial vacuum - The same volume of air as the cap is removed and for human purposes this is enough to keep most goods fresh and edible for long periods of time. For the engineers out there technically speaking there is no vacuum until the cap is pulled upward without pressing the button. Either way the Vacs will keep goods fresher for longer and prevent weevil and bug infestations. This reality is why globally we have sold over 10 million Vacs without advertising. No batteries or electricity required! The Tightvac patented system is able to preserve goods for 1 year and beyond by allowing products to breath and degas. Almost all food goods are smell proof inside the Vacs, however some products like freshly roasted coffee and medical herbs may degas, leaking there odor. Our 2 way valve allows gas build up to slowly escape without letting oxygen in. This is one of the main reasons it can preserve goods for long periods of time. Note: Medical herbs that are sticky and smelly we recommend using a strong zip lock bag inside the Vac. 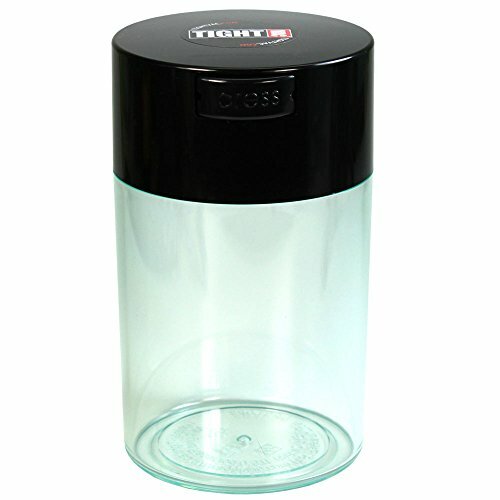 This helps contain the smell and keeps the area clean where the body and the cap meet. This is essential to create a smell proof situation. The sticky resin often created by these products can compromise the open and close system, causing the caps to crack when opening and closing under such pressure of a glue like substance. Keep these areas free from resin buildup. Use a product like Grundge off. Thus maximizing the efficiency of use and longevity of the Vacs. Yes the Tightvac patented system keeps moisture and oxygen out - these elements cannot enter the container unless you decide to take the cap off. Yes the Vacs are made with NSF and FDA approved PS # 6, this plastic is very strong. If properly cared for the Vacs can easily last for 10 years. These days shipping methods are very rough, packages being thrown, automated systems dropping huge parcels on top of smaller ones. If your Vac arrives damaged please report this IMMEDIATELY UPON RECEIPT for a part or full replacement. We offer 10 different sizes and 3 styles of Vacs - Solid - Clear and Tint. Often a Solid and Tint Vac will have a slightly looser fitting cap then a clear model. It is a misconception that a tighter fitting cap is working better or holding more of a seal. Loose caps function just as well and will tighten with time and use. If you have any questions about this product by Tightpac America, Inc., contact us by completing and submitting the form below. If you are looking for a specif part number, please include it with your message.